Our occupancy along with our two-year clock to raise funds to buy the building began to tick on August 1, 2017. 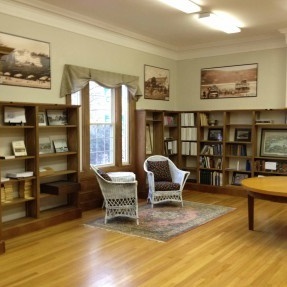 Since August, SHS volunteers have transformed the main floor into our new archives. Landscaping has been restored, walls freshly painted, the original oak floor in the main room restored and new flooring installed in the office and main archive storage room. Many car loads of historical papers, photos, books, clothing, maps, drawings, and ephemera have been transported from the closed museum and its unheated storage loft, to our new archives. We now have donations and pledges totally more than $300,000, well on our way to our goal of $500,000. Critical improvements including a new heating and ventilating system will wait until after we have been able to purchase the building. In April we will hold our third open house. Please stop by Mondays from 1 to 4 PM or by appointment. 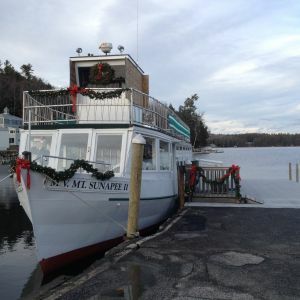 We have on display items never before seen, as well as several new additions, including a mounted Lake Trout, one of the largest ever taken from Lake Sunapee. Please consider a generous contribution to the Archives Fund so we can achieve our $500,000 goal. 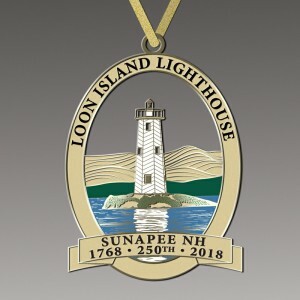 Our new Sunapee 250th anniversary commemorative ornament of Loon Island Lighthouse is here. Gold plated brass with white, blue and green enameled highlights in a gift box.